PICTURES OF ME IN ACTION! A sketch show written by Kasey Daley & Elizabeth Quinn, Marilyn & McCoo were a duo who had middled the charts in the 70s. 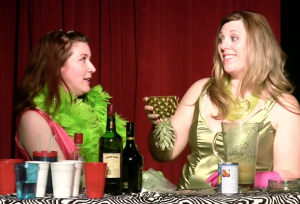 Getting back together for one last show, this drunken show had a run at the People’s Improv Theater in 2009. In this below clip, Marilyn & McCoo celebrate Barack Obama’s presidential win by making Obamatinis for the audience.